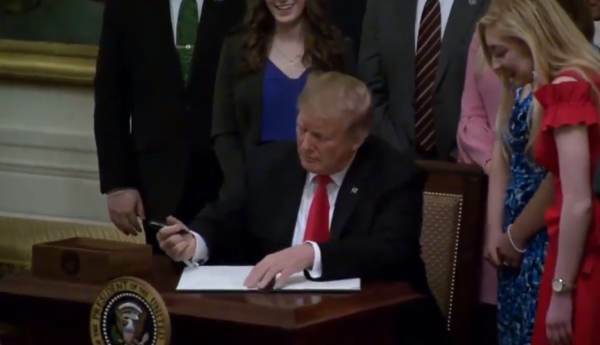 President Donald Trump signed an executive order on Thursday requiring colleges that receive federal funding to comply with the First Amendment’s protection of free speech. The executive order declares that twelve federal grant agencies and the Office of Management and Budget be sure that any colleges receiving research or education grants are upholding the freedom of speech and principles of free inquiry. It will not apply to student aid. Conservative speakers on campus are regularly cancelled due to what essentially amounts to Heckler’s Vetoes and right-wing students have faced severe bias against them since the 2016 election. The president invited students on stage to share their stories of being silenced or having their free speech restricted on their college campuses prior to the signing, including a young woman who was barred from handing out Valentine’s Day cards with Christian messages written on them. “You refuse to be silenced by powerful institutions and closed-minded critics,” the president said.